The 4 winning teams presented their projects on May 5, 2017. Videos of their projects and final presentations can be found here. Four winning teams were chosen from among 8 semifinalist teams after making five-minute pitches in a public program on December 9, 2016. The winning teams, whose members have been named FIA Innovation Fellows, will share in up to $10,000 per team in stipends and expenses to carry out projects aimed at using virtual and augmented reality to address real-world challenges. 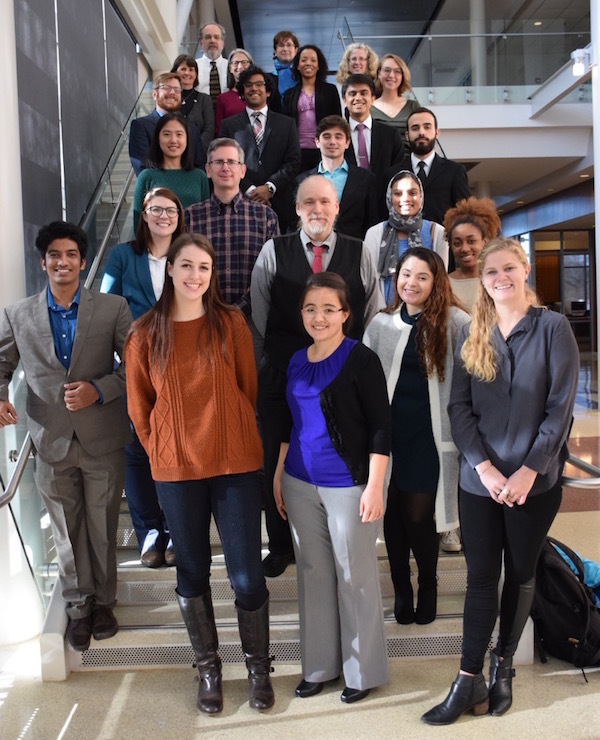 Altogether, these four teams include 16 students and 5 faculty mentors from 8 UMD colleges and schools. The teams plan to consult with several FIA and outside partners during the course of their work. Learn more about the spark grant competition here. We propose the development of an innovative storytelling method combining Virtual Reality video and motion-graphic data visualizations, allowing those who experience it to develop a deeper understanding of the challenge that poorer, African-American families in some Southeast Washington, D.C. neighborhoods face in easily obtaining nutritious food. To develop the project, we plan to work with WAMU, a media organization with a deep commitment to covering diverse communities in the Washington area, to produce an innovative, effective marriage of data visualization and VR video. In addition to releasing a proof-of-concept story on “food deserts” in Southeast Washington, we will produce an open-source package of data visualization templates specifically tailored for VR video environments, for use by other storytellers. We will also produce a digital “how-to” guide to help others build on our storytelling method and tutorials on the use of our template package. Students today are taught a lot of information without learning how to effectively remember everything, resulting in a sub-optimal educational system. Decades of cognitive psychology research has established that how knowledge is structured in memory moderates the ability to retain, recall, and apply it, with mnemonics as a powerful memory enhancing tool. One mnemonics device is the method of loci (MOL), which emphasizes association and spatial/visual recall to improve memorization. Though effective, MOL is incredibly difficult to master. In this proposal, we outline our vision for a virtual reality educational platform where users build, share, and explore customizable memory palaces to teach or learn anything they desire. We will evaluate outcomes including short/long-term recall and product usability to validate virtual-reality as an effective medium and guide future development. Our platform will foster a community-based learning environment with broad applications including, but not limited to, improving health literacy and self-efficacy. By exploring how 360­degree photos and videos can be used to create augmented news articles that allow the reader to see “The Rest of the Story” we seek to support improved trust in the credibility of photojournalists. The technology to capture 360­degree content and the ability to view has left its nascent state. Now is the time to look beyond just entertainment and to develop techniques and additional technologies to capitalize on these advances to serve the public good. In terms of FIA priorities, Credibility is the one most served by allowing the reader to view the context in which photos are taken and stories took place. The priorities of InfoLiteracy and Culture are also served; by helping readers become more media literate (increasing the awareness of how an article might not provide a full context) and through the types of news stories used to demonstrate our ideas. The project will address one of the critical areas in providing education and services to students with autism spectrum disorders (ASD) who are transitioning from high school to adult life (i.e., employment, post-secondary education, independent living). A multidisciplinary team (special education, hearing and speech sciences, engineering, and information sciences) will develop an Augmented Reality (AR) app that will be used to teach socially appropriate behaviors to adolescents with ASD. The team will partner with the Barrie School and conduct design sessions with typically developing students who are passionate about learning design processes and characteristics of students with ASD. The team will create age-appropriate social interaction scenarios with Barrie school students, which will be used in the design of the AR app. Once the team designs the AR app, they will examine the effectiveness of the AR app with adolescents with ASD.